It is September of 2017, and EKD’s Milano display has been taking center stage in EKD’s showroom expansion for a couple of weeks now and the response has been amazing. We took you through the design and installation process – we felt like we had fairly decent notions about what the space would feel like when it was completed. We were not let down. We’re going to fill you in on some of our favorite details about the space and what people are saying about it. In a space that is so beautiful, how do you start to whittle down to a few things you like best? Well, one thing that has caused a good deal of chatter is the sink and faucets! The sink is nearly five feet long – but does not overwhelm the 12-foot island. 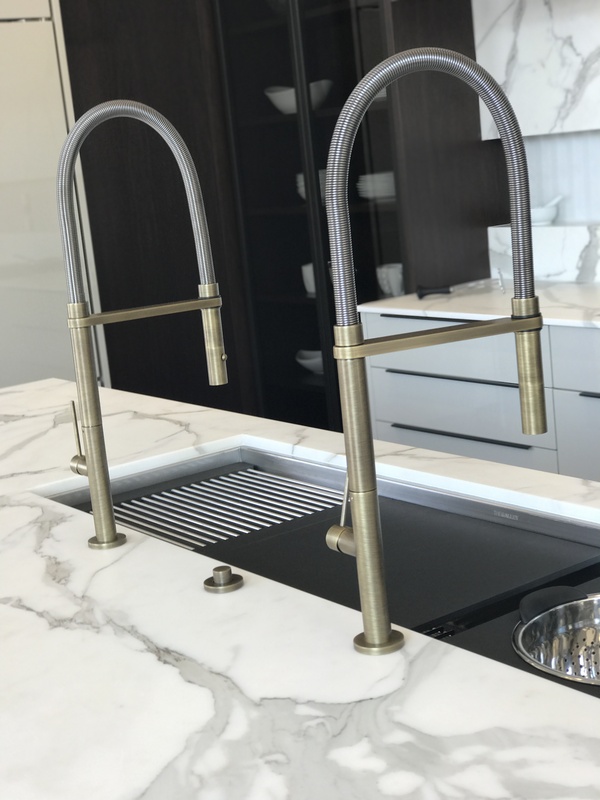 Within the island, the double brushed brass faucets make quite the statement. Though the sink is one basin, the length allows two faucets to be very useful for both prep and clean up. 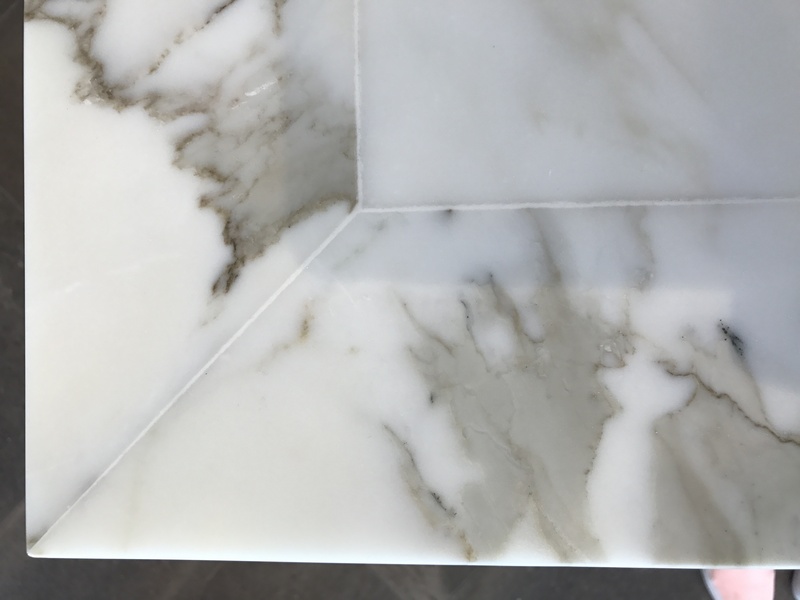 Another ‘small’ detail we love about this space, is the bookmatched Calcatta marble. 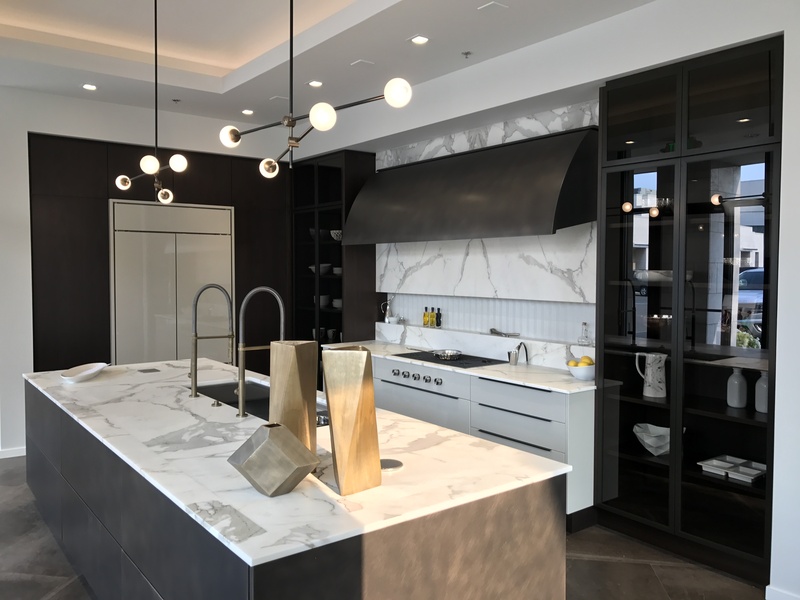 The marble backsplash against the bronze hood is striking enough, but when you take a closer look, you notice that the marble is bookmatched, from the counter top – to the ceiling. 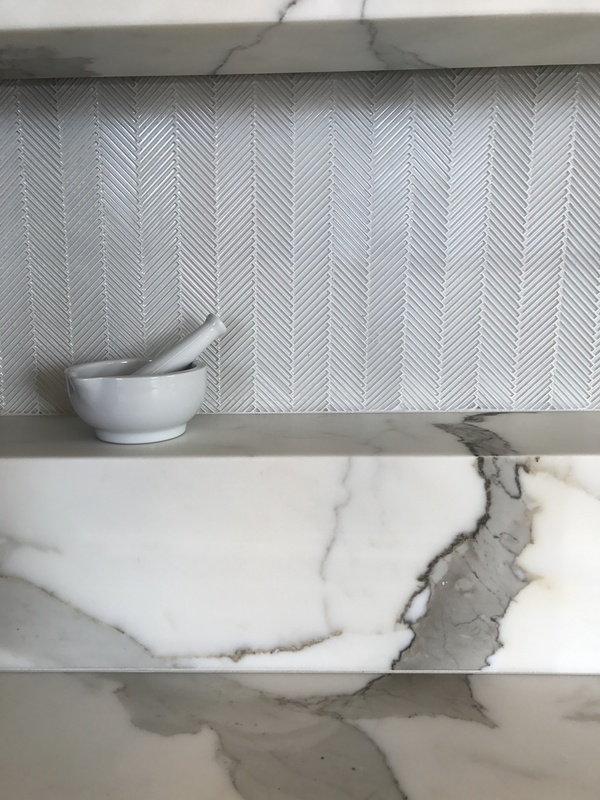 The delicate, custom herringbone backsplash contrasts with texture and depth. Besides the amazing backsplash, the island features a ‘framed’ marble top. The careful arrangement and barely-there seams of the island create a unique subtle elegance. In fact, when running your hand over the seams, you may not even feel the seams. Now that is smooth. While beautiful design is what we do – the functionality, that’s what makes a success. 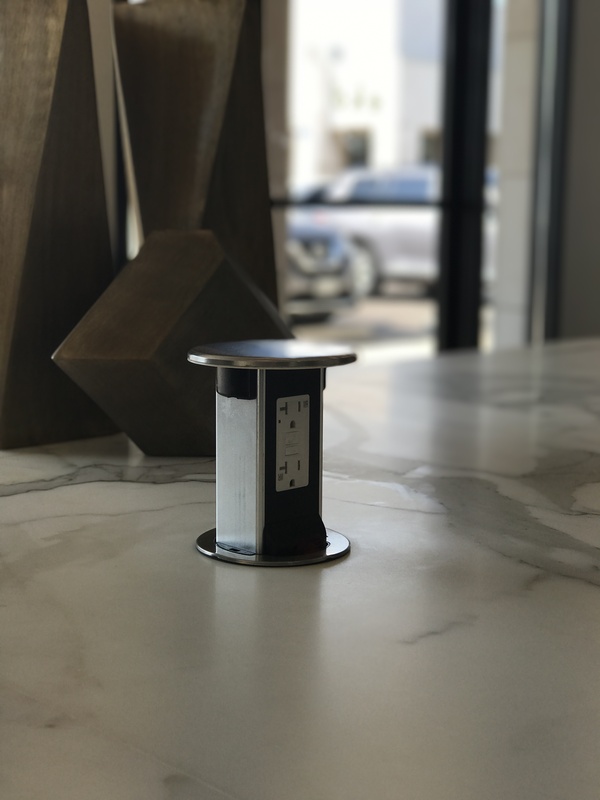 The Milano showcases two styles of concealed outlets on either side of the island. 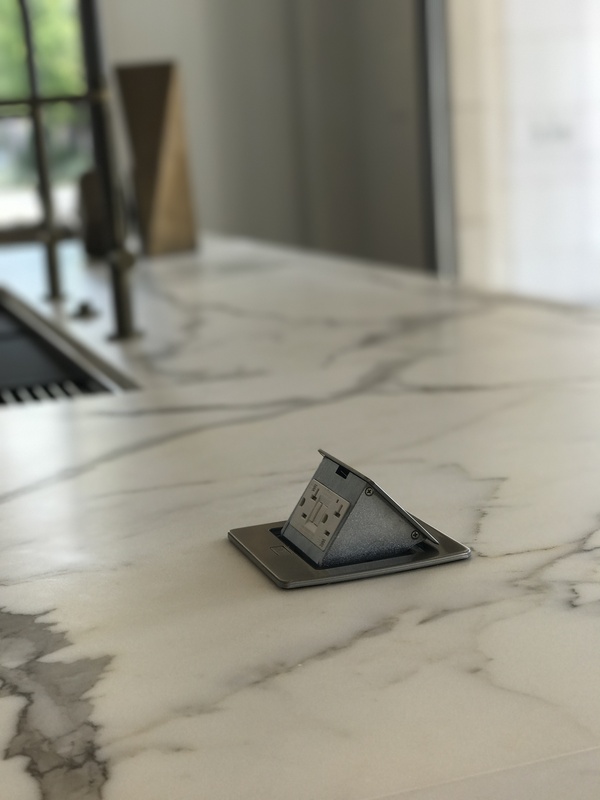 With the island functioning as such a large work and prep space, it is important to take into account how the counter space will likely be used. When all is said and done – EKD’s new Milano display is the new darling of the showroom. Make sure you stop by and see what all of the fuss is about and our other new display, Moody Blue! You can also see what we’re up to on social media! Follow us on Facebook and Instagram!